LONDON, United Kingdom — As consumer appetite grows for convenient, nutritionally-dense, environmentally-friendly food solutions, the market is becoming increasingly fertile for ethical meal replacement companies to prosper. Two leading the charge are the UK’s Huel and America’s Soylent, with the British Isles providing the battleground for 2019, following the latter’s UK launch last September – its first overseas expansion since launching in 2014. In the same month, Huel announced its first investment round of £20 million, the only external investment since being set up in 2015, and partnered with Chinese e-commerce platform JD.com, granting it access to the company’s 300 million users — a decision that’s helped the brand to become one of the UK’s fastest growing companies. Read more: Is Huel Set To Become ‘The Food Of The Future’ Following £20M Investment? Having enjoyed its best-ever January thanks to record sales, Huel recently revealed revenues of over £5.3 million, equating to a meal sold every second. The powdered-meal startup has now sold over 35 million meals in over 80 countries, with 2.7 million sold in January alone, and an annual turnover of £40 million. Founder Julian Hearn said: “Our January sales reflect a notable growth in consumers searching for more nutritional, convenient solutions.” Driving the trend, according to Hearn, is a voracious appetite for vegetarian and vegan options that is trending globally. “In general we have been embraced in the same way across the world,” commented Hearn, highlighting that the global market for vegetarian and vegan products is now worth over $51 billion, according to Euromonitor. “The type of people who love us exist in all countries. We are all humans and although there are cultural differences there is a core of people who want to find a healthier, more sustainable solution to their time-pressured meals. ensuring we reach £200 to £250 million (of annual turnover) in four years from now,” he added. Muscling in on Huel’s turf, Soylent announced its arrival in the UK last year, hoping to replicate its US success in securing cult status among gamers, students and millennials. After initial teething problems and a PR fiasco exposed by a Vice investigation, Soylent gained popularity as a high-protein workout supplement and convenient option for time-strapped tech workers in Silicon Valley. In January 2018 it went mainstream, becoming the top grocery product across Amazon in the US. Andrew Thomas, VP of marketing at Soylent, said the brand would target gamers, urban millennial achievers and students with busy schedules as the core of its UK launch strategy. 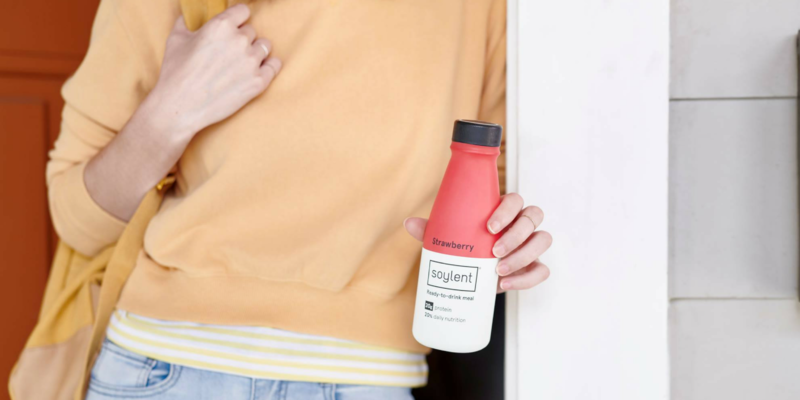 Meanwhile the company’s research – reported on BeverageDaily – revealed that UK consumers skip four meals per week on average, most commonly breakfast, a gap Soylent hopes to fill. According to a recent interview in Techworld, the company, which has raised over $72 million in venture funding, is not seeking further capital at this time but does have plans to broaden out its business model beyond products. Ultimately, according to nutritionist and Huel Co-Founder James Collier, convenience will always be the major factor driving food choice around the world, but education and understanding of nutrition and ethical sustainability will increasingly influence consumer tastes. “Convenience eating is a major factor for people’s food choice, but people aren’t just opting for junk food,” Collier said, when explaining the brand’s record sales this year. “There’s a clear trend towards nutritious and convenient foods and plant-based diets are continuing to rise in popularity,” he added. But it’s not just people moving over to 100% plant-based diets. As more and more people acknowledge the nutritional, ecological and ethical benefits of consuming less meat, food solutions such as these are likely to continue to experience a surge in sales.